We have found that a variety of Cas9-mediated genome modifications can be efficiently generated in Drosophila and transmitted through the germline. Using an injection approach, stable lines with targeted genome alterations can be generated within a month. phsp70-Cas9 and a single chiRNA plasmid can be coinjected to generate mutations via imperfectly repaired DSBs. Coinjection of phsp70-Cas9 and plasmids encoding two chiRNAs can induce defined deletions between the two cleavage sites, while the addition of an ssODN donor template can mediate gene replacement by homologous recombination. For the sgRNA, vector pMB60 allows in vitro production of RNA from the T7 promoter, while pMB70 is designed for in vivo transcrition controlled by the regulatory sequences of an RNA polymerase III transcribed U6 snRNA. In both vectors, the target site sequence can be added by inserting an oligonucleotide linker into BsaI digested vector. 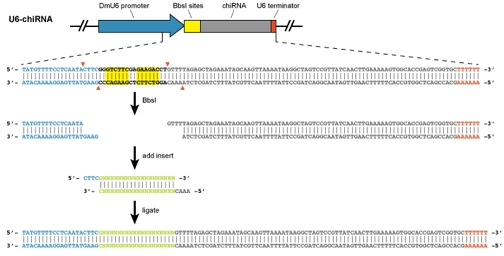 Targeting chiRNAs are easily cloned by annealed oligos into the pU6-BbsI-chiRNA plasmid via the BbsI restriction sites. CRISPR Optimal Target FinderIdentifies gRNA target sequences from an input sequence and checks for off-target binding. Currently supports over 20 model and non-model invertebrate species. Genome engineering of Drosophila with the CRISPR RNA-guided Cas9 nuclease. Scott J. Gratz, Alexander M. Cummings, Jennifer N. Nguyen, Danielle C. Hamm, Laura K. Donohue, Melissa M. Harrison, Jill Wildonger and Kate M. O’Connor-Giles. Genetics . 2013 May 24. PubMed . GENETICS.